We know that across Africa, some women farmers like Anne, Maria and Liberata are making agriculture pay. But for millions of others, life is much harder. Women make up half of Africa’s agricultural workforce, but produce less per unit of land than men. Not because they’re less able, less resourceful or less motivated, but because they don’t have equal access to resources like land, training and tools. Our new joint report with the World Bank, Levelling the Field: Improving Opportunities for Women Farmers in Africa, reveals that by closing the gender gap globally, women farmers could produce up to 30% more, and help lift up to 150 million people out of poverty. 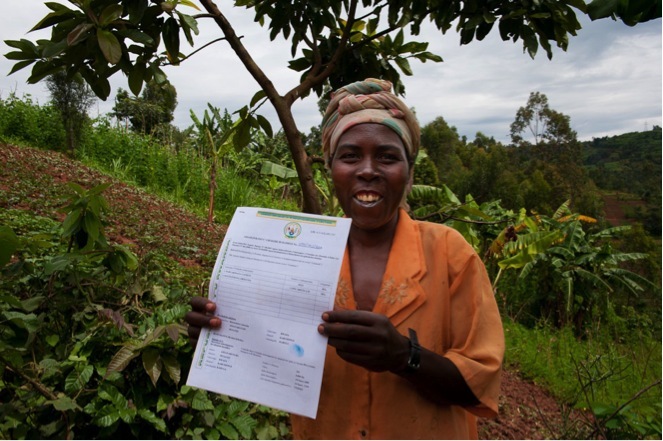 Liberata holds the title deed for the land she owns in Rwanda. Photo: Landesa. Women are less likely than men to control land. When they do, they can invest more in their farms, like Liberata who bought better fertiliser, which means more produce and more profit. Women often have to look after children, which means they have less time to devote to their farm. Local child-care centres, like those already running in Mozambique and Togo, can help solve this problem. Mobile phone apps mean women farmers can now access farming training without having to travel long distances from their family. These apps can also help them access markets and improve their literacy skills. Providing training to a few women farmers and encouraging them to spread this information through their social circles is another way to improve women’s knowledge of better farming methods. Cash crops such as cotton, coffee or peanuts are more profitable than staple crops like corn or beans. Enabling women to shift into commercial agriculture will boost incomes and the local economy. Find out more about the gender gap in agriculture and how to close it by downloading the full report.